Backup MariaDB is highly related to MySQL backup, a well-developed Handy Backup feature. Handy Backup performs MariaDB backup via a new dedicated data option that is slightly different from the traditional “MySQL” data source. 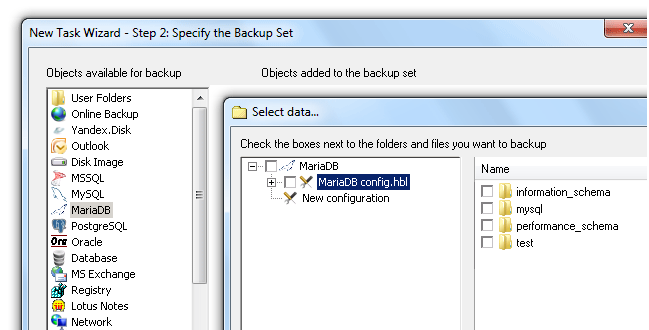 Let us describe our new MariaDB backup tool in some details. MariaDB is a product developed from MySQL, retaining many features and functions of its predecessor. However, newer selection of data storage engines and some other improvements in effectiveness allow using a completely new backup and restoration tool for MariaDB. The process of connection with MariaDB server instance bears some differences with the similar process of establishing connection with a copy of the traditional MySQL database engine. Therefore, “MariaDB” and “MySQL” data source options can also differ in some details. Handy Backup allows MariaDB backup database in both “hot” and “cold” modes, where “hot” means that MariaDB server application continues to run. It provides speed and reliability, but sometimes outdate some transactions, so from time to time server stops for “cold” backup. Advanced controlling options, including running as Windows service and user notifications. These and many other features turns Handy Backup into a powerful server solution for keeping and cloning copies of MariaDB content. Note that MariaDB is just one of Handy Backup data source option, e.g. you do not need to purchase a separate edition for saving MariaDB only! Handy Backup Small Server is the unified server backup software package, already containing MariaDB database backup along with other server data backup options. Free 30-days trial version! Handy Backup outstands any other popular database backup solution by unification, automation and effectiveness. To compare Handy Backup features with some most popular utilities allowing backing up data from MariaDB, let us mention these solutions. Utility mysqldump. Ever-popular command-line tool, this utility builds often a base for different scripts and cron-based jobs for dumping MariadB data. This simple software requires a lot of skills and knowledge to use it properly, and can lock a database for too long time. 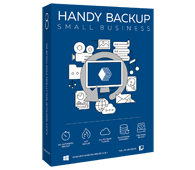 In other hand, Handy Backup provides a fully automated, quick and stable job without any special requirements for users. A price tag is also quite reasonable for both server-level editions already including MariaDB backup tool into the package or for a separately purchased option.